Features a 3mm shell to add hefty projection to classic steel musicality. Gretsch’s USA Solid Steel snare is power, versatility, definition and sensitivity all wrapped into one snare drum. It’s constructed using a 3mm reinforced solid steel shell with a 45-degree bearing edge. The drum is plated in black chrome, detailed with a center shell Gretsch knurl pattern, and assembled using classic Gretsch 10 lugs layout. Added features include a Lightning throw-off, die-cast hoops, 'Snap-In' key holder and 42-Strand snare wire. 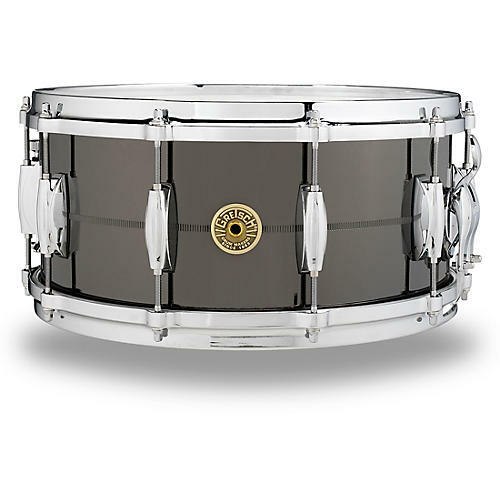 Snare size:	14 x 6-1/2 in. Call or click to order this US-made snare today!